There are several types of stain and it can get confusing knowing which to use and when. Go into any home improvement center or paint store and you will be offered basically 4 types of stain. Oil stain, water based stain, gel stain and varnish stain. There are other types as well and we will touch on those too. Here is the information you need to help you choose the right one for your project. These are the most widely available and the ones most people are familiar with. 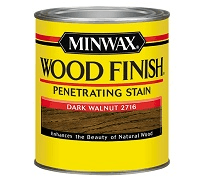 Minwax is a popular brand. Linseed oil is a common component and because these dry so slowly, they are easy to work with and give the user the time needed to remove excessive stain prior to drying. The easiest way to determine if it is a oil based stain is the label. The solvent for oil based stains is mineral spirits and that will be listed as what to use for clean up. Usually the color is from a pigment but occasionally an oil stain can be a hybrid of both pigment and dye. An oil based stain is safe to use under any finish except a water based finish. Almost all gel stains are oil based. Easily spotted by their super thick consistency. Great on pine wood and easy to use for creating “grain” on fiberglass doors. These dry very slowly so they are easy to work with. Color selection can be a challenge unless buying online. The choice of professionals. Mainly because they dry so fast a finish can be applied in about 30 minutes. Much harder to work with. Not a choice for an amateur or do-it-yourselfer. A stain, pigment or dye can also be added to lacquer finish to create a toner to adjust the color between coats of finish. Easy to identify by their strong solvent smell. Water based stains substitute solvent based thinner with water and use pigments or dyes that are soluble in water. If the label states that cleanup is with soap and water, it’s a water based stain. These dry much faster then oil based stains but not as fast as a lacquer or alcohol based stain. Water based stains are the best choice when using a water based finish. One of the biggest drawbacks with these is that they tend to raise the grain of the wood. One trick if planning to use a water based stain is to wet the surface of the wood to raise the grain, then sand it when dry. You are then safe to stain. There are additional types of stain but these are the most common. We will discuss other more complex types of stain in the near future.